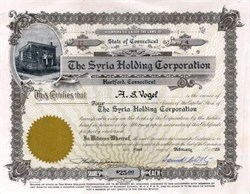 Beautifully engraved certificate from the Syria Holding Corporation issued in 1928. This historic document has an ornate border around it with a vignette of Syria Grotto Building. This item is hand signed by the Company’s President and Treasurer and is over 77 years old. The chief moving spirit in the founding of this organization was LeRoy Fairchild. In the summer of 1889 a group of Master Masons, member of Hamilton Lodge #120 at Hamilton, New York, met to organize and hold informal meetings. what this group was seeking was fun and good fellowship. At their meeting on September 10, 1889, they decided to honor the founder by calling it "Fairchild Deviltry Committee." It was decided that this organization be confined to Master Masons in good standing. The idea of the Order proved to be attractive and many distinguished Masons joined. The Order could no longer be confined to any one locality and in response to imperative request other groups were formed On June 13, 1890 the Fairchild Deviltry Committee duly established and formed the Supreme Council, Mystic Order of Veiled Prophets of the Enchanted Realm. Its purpose mainly was to add in greater measure to the Masonic fraternal spirit the charm of radiant cheerfulness and to maintain within the fraternity an impetus of royal good fellowship, where in joyous companionship and helpful sympathy shall mingle graciously and become the distinguishing characteristics of the Order. The late LeRoy Fairchild, who is revered by all Prophets of the Mystic Order of Veiled Prophets of the Enchanted Realm as the founder of the Order, was an earnest, devoted Mason and an enthusiastic believer in the helpful influence of mirth. he loved his Brethren with an ardor of a true Mason and man and always sought to bring joy to their hearts by the cultivation of sunny cheerfulness and indulgence in healthy merriment and joyful laughter. 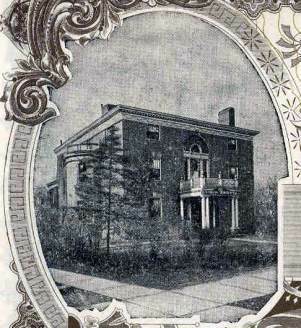 he believed with all his heart that the beneficial influence of Masonry would be far greater if along with the inculcation of sublime moral lessons, opportunities were afforded for the cultivation of a greater spirit of cheerfulness and good fellowship amongst the members than was possible in the Blue Lodge. The founding and growth of the Order of Veiled Prophets of the Enchanted Realm is phenomenal in the history of fraternal organizations, and proves that a really good thing will grow on its merits, even if it has no powerful combination back of it to press it to the front.